One of my favourites, for years and years. I can’t remember when I first encountered The Plague and I, but certain expressions and catchphrases from it have passed into our family shorthand, so my guess is that my parents loved it too.’Toecover’, for instance, a word that describes a hand-made object of uncertain usage and all-too-certain unpleasantness. Ideally, a toecover should have no discernible function, and – in my opinion – involve limp crochet in some respect. Then there’s ‘Hush ma mouth, what have ah said?’, delivered in a clichéd Southern accent. This should be deployed after the ostensibly inadvertent revelation of some fact that has got the speaker into trouble, and is ironically directed at the person who has given the game away. Then – no, enough already. You get the idea. 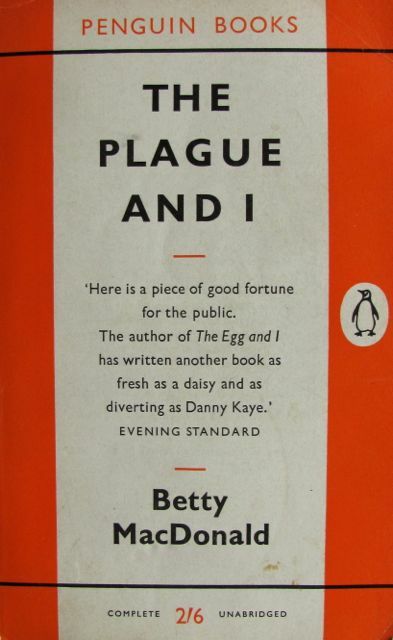 In the late 1930s Betty MacDonald – who had led a slightly unconventional life but who had, as yet, not committed any of it to paper (her best-known book is probably The Egg and I, about her first marriage to a chicken farmer and which came out in 1945) – developed a series of colds, then a cough, then extreme tiredness… But, ‘operating under the impression that I was healthy and that everyone who worked felt the same as I did’, failed to put two and two together. In all fairness, so did a series of doctors (largely because she consulted each specialist about his – and I mean his – own area), until she was finally diagnosed with TB. Tuberculosis, of course, could be tantamount to a death sentence. As it can now, sometimes – but then there were no drugs which worked against it and it was horribly prevalent. It’s also highly contaigious and MacDonald caught hers from a co-worker who managed to infect several other people as well. 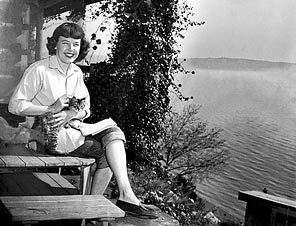 As a single mother with two small children and a negligible income, she was luckily admitted to a charitable sanatorium in Seattle, which she calls ‘The Pines’ in the book. She was to stay at Firland Sanatorium for nine months, in 1937-8, and emerged cured. MacDonald is extremely good at expressing the life of any closed institution. The way the world narrows down; the way rumours (‘all based on a little bit of truth’) start, expand and spread; the effect of being thrown into involuntary contact with people you would normally avoid, and the intensity of the resulting reactions. (‘…the major irritation of all was my room-mate, who was so damned happy all the time, so well adjusted. She loved the institution and the institution loved her. She loved all the nurses and the nurses loved her. She loved all the other patients and all the other patients, but one, loved her. That one used to lie awake in the long dark cold winter nights and listen hopefully for her breathing to stop.’) It was a tough regime, but it had to be – no drugs, remember. TB was essentially treated by rest and some basic chest operations; there had to be rules. But there was also the pointless expression of power indulged in by some: ‘ “We do not tell the patients the rules, Mrs Bard. We find that trial and error method is the best way to learn them.” I said, “But how can I be obedient, co-operative, and helpful if I don’t know what I’m supposed to do?” She said, “We don’t allow arguing, Mrs Bard”…‘ She is also very good on how difficult it is to adapt to life afterwards, describing what could almost be a type of Stockholm Syndrome. But she did shake herself free, and the TB didn’t reappear. So yes, a sort of happy ending. ‘Sort of’ because Betty MacDonald died in 1958, from cancer, at the age of only 49. I’m sure she would have been surprised and possibly flattered to know that people were still enjoying her books over fifty years later. I most certainly am. Great book. This entry was posted in Autobiography, Classics, Non-fiction and tagged autobiographical books, non-fiction on November 9, 2013 by Kate. I hadn’t heard of Egg and I, but the name Betty MacDonald sounded familiar. Looking her up, it turns out she wrote the Mrs. Piggle-Wiggle books that I loved as a kid!